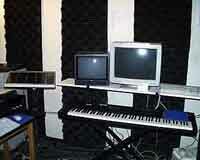 The Recording and Electronic Music studio offers workstations with a variety of different equipment to facilitate the work of faculty and students. 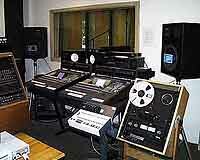 Below is the studio divided into four sections, with a link to pages detailing the equipment found in each area. 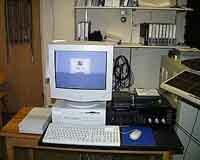 This area holds our PowerPC with Yamaha 4X CDRW/CDR CD burner, our Tascam DA30 DAT recorder, JAZZ 2 Gig removable drive and Glyph 4 Gig drive for mastering and making Compact Disks. Middle Section 1 This station has a video monitor for working with sound and music for videos (FX), the Octapad Percussion Controller and the Roland A-80 MIDI Keyboard Controller. 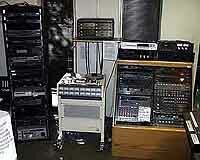 This section has the Synth Rack, Otari 16 TK, FX Rack, Mixer, another DAT and other recording equipment. Right Section This mixing section holds the Yamaha O2R mixer and the Akai digital recorder, the amplifiers and the monitors, and offers a view through the window into the performance studio.